Edina senior Peter Larson didn’t set any records Saturday like he did in the preliminaries. He simply went 4-for-4 in his races at the Class 2A boys’ swimming and diving state meet. 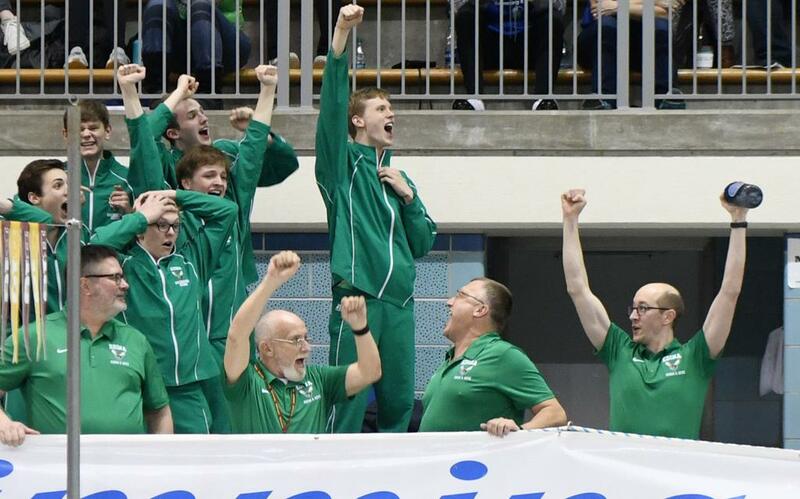 His efforts, along with his team’s deep roster, helped Edina win its first boys’ swimming and diving state title since it completed a three-peat in 2008-10. Edina won events — all freestyle races — and scored points in all but two events to earn 268 total points Saturday at Jean K. Freeman Aquatic Center at the University of Minnesota. Chanhassen/Chaska finished second with 205 points and Wayzata placed third with 176 points. Larson won the 50 freestyle (20.06 seconds), 100 freestyle (43.77), swam the first leg of the winning 200 freestyle relay (1:23.67 with Charlie Webb, Max Dow and Andrew Gray) and anchored the first-place 400 freestyle relay (3:01.76 with Gray, Gabe Baker and Keegan Duffy). In addition to the relays, Gray, a senior, also won the 200 freestyle (1:37.68) in a tight race with Prior Lake senior Sean Dwyer (1:37.87). Gray took second in the 100 butterfly (48.95), behind Lakeville North senior Andrew Trepanier (48.49). Edina had the most entries going into the meet and coach Scott Johnson talked about the full team effort. St. Louis Park sophomore Hayden Zheng followed up a state title in last year’s breaststroke by breaking a state record that was only hours old. Zheng won in 53.86, surprising even himself with the time. He broke a state record his friend Andrew Karpenko broke in the Class 1A meet in the afternoon. Zheng also won the 200 individual medley (1:48.25) after finishing third last year and 10th the year before. • Rochester Mayo junior Jacob Walz, a nephew of Gov.Tim Walz, swam a 47.75 split on the third leg of the 400 freestyle relay to help the Spartans finish ninth overall (3:12.12). 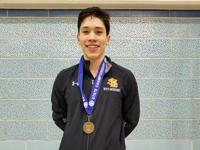 • In Class 2A diving, Stillwater junior Josiah Fick won the gold medal with a 389.35 score.